Another week, another catch up post. I thought when I got my couch I'd be all over the blogging again but I've just turned into a potato instead. So here I am doing an "omnibus post" again. And it's a long weekend for us so I'll be away until next Tuesday. I can't believe it's August already! I think my face says it all. This outfit was boring. I was wearing a belt earlier but I had a roti for lunch which made me all "bloaty" so I took it off. Yeah, pretty underwhelming. I might put this dress in my donate pile. That would help free up some space in my closet. On Monday I wore my bat dress. Ok, it's not really a bat dress but I think the embroidery at the bottom looks like flying bats. See, it even has wings on the sides. Like bats! Tuesday's outfit wasn't photo worthy so lets move on to Wednesday, July 31. This outfit made me happy. 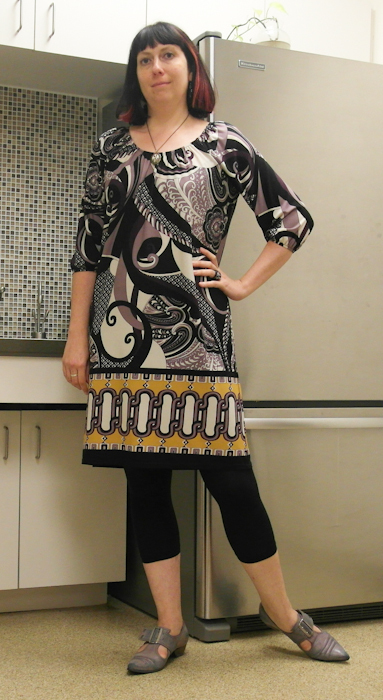 Black dress and leggings, purple cardigan, shoes with pink buckles. Yesterday I had my coloured and cut. The red is gone. It's been 7 years so it was time. Shall I shut up now? I'll shut up now. Looking forward to seeing your new hair, sans rouge. The bat dress is amazing. I do love the Pilgrims in the first outfit. I really love your 'bat dress', love that decó print and you look gorgeous wearing it! 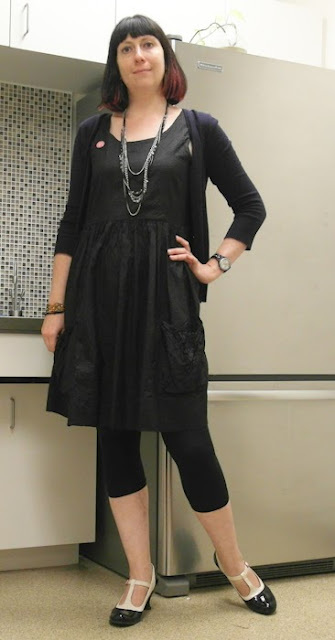 And black leggings and pretty shoes look always fabulous together!, hope you enjoy an amazing hairstyling! That free people dress is really and truly gorgeous. The first dress is okay, but it doesn't really *sing* the way most of your clothes do. I will miss the red! Ah, I love the bat dress. And you do shorty leggings with a dress so well. I need to take notes. Bye bye red hair streak! 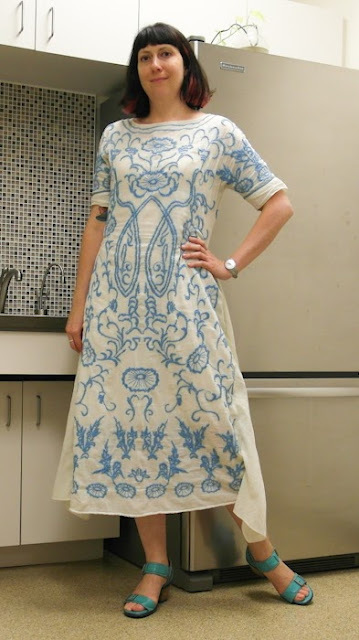 Even thought the print on the first dress in kind of cool, the shape is just "meh" and if you don't feel fabulous in it, then move it out! The bat dress is fun, and the short black dress is cute. I've been wearing a lot of black lately and it's been making me feel good. I think that in my head, Summer is over ;) I want to see your new hair do! I quite like #1 as well, excellent pattern! Though you really do look enviably great in everything, post-roti or no, maybe it's the silhouette that's not fabulous? The BAT DRESS on the other hand - stupendous!